A gold medal was the ultimate prize for the US women’s hockey team. PYEONGCHANG, South Korea — Monique Lamoureux-Morando had planned to sleep with her gold medal around her neck. But that plan was changed just slightly. Meghan Duggan, on the other hand, Team USA captain, did catch some shut-eye with her newest Olympic medal and first gold around her neck. Lamoureux-Morando, Duggan, Hilary Knight, Gigi Marvin, Jocelyne Lamoureux-Davidson, and Kacey Bellamy represent the longest-tenured members of the US women’s Olympic hockey team, all at their third Winter Games. 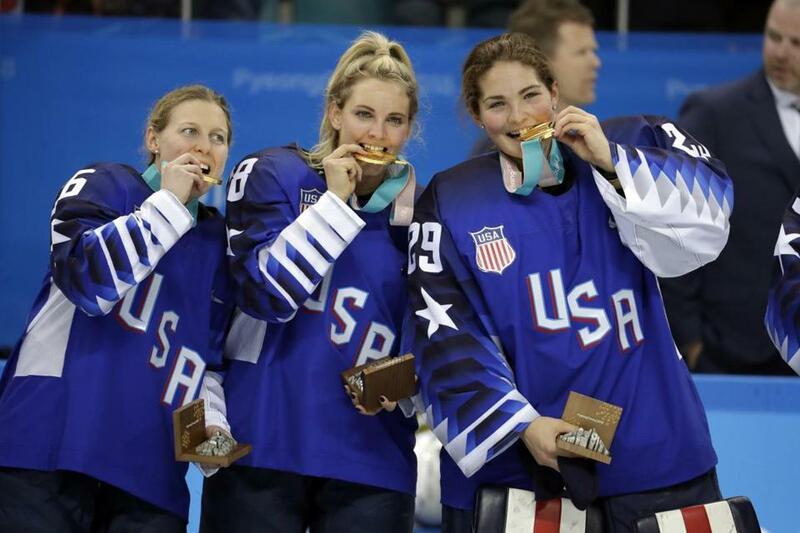 They said it simply is an indescribable feeling to have a new kind of necklace, as Lamoureux-Davidson called it, after the Americans defeated the Canadians, 3-2, in an epic gold-medal shootout on Thursday. The contest not only stands as the ultimate highlight at the PyeongChang Winter Games for the United States, but also one that will go down in sports lore as one of the greatest Olympic hockey games, ending a 20-year gold-medal drought for the US women against their absolute rival. And it was these veterans, these three-time Olympians who know heartbreak and defeat all too well, who proved to be the difference. They repeatedly said there was never any doubt they would walk away from these Games with a “tangible success,” as Knight put it earlier this week. They knew the chemistry they had in the locker room. “I wish you guys could be in the room, it’s something special,” said Knight, who scored in the first period. They knew a 2-1 deficit heading into the third period was nowhere close to the greatest challenge they faced in the last 12 months. They knew Lamoureux-Morando would find the net on a breakaway in the third to send it to overtime and the eventual shootout. They knew Marvin would get the shootout started by making her shot and that Lamoureux-Davidson would bury her watch-on-loop worthy Oops I Did It Again move to give them the edge on the sixth shot. And they knew their 20-year-old goalie, Maddie Rooney, as calm and cool a backstopper as a team could hope to have, would stop Canada’s final attempt, cueing a dogpile, long braces, tears, Journey’s “Don’t Stop Believing,” pure elation, and eventually, the reception of their gold medals. “It’s all about your heart and your mind and your person,” Marvin said after the game. “Man, I’m just so proud of my teammates. But a short journey, an easy path to gold this was not. After an agonizing overtime defeat against the Canadians in Sochi four years ago, introspection and reevaluation about working for a third Olympic appearance was required. Would it be worth spending four years training for just a chance at a spot on the team? And for just a chance to maybe reach the gold-medal game? Ultimately, the answer proved to be yes, and the journey was rewarded. “It didn’t take too long to figure out that we still have a love and passion for the game and we got that opportunity and we took it,” Lamoureux-Morando said after the game. Of course, taking a stand for fair pay cannot be overlooked in the winding road to these Games. Threatening a strike before the 2017 World Championships to force USA Hockey’s hand toward a better contract was a challenge this group of veteran players helped spearhead, eventually weathering the storm as the governing body increased wages from $6,000 in Olympic years to a reported $70,000 annually with the chance to earn more than $100,000, as well as better per diems, travel, et al. As Lamoureux-Morando said earlier this week, no amount of team-building could have created as strong of a bond as fighting for fair pay did. Throughout it, they stuck together, they trusted each other. The United States woke up Thursday to this result, to images of these fierce competitors and trailblazers waving American flags on the ice, embracing each other in victory, savoring a moment they had imagined 1,000 times but had not yet experienced. Knight kept her phone off for a while after the game, but after turning it on it was overflowing with congratulatory and supportive messages, so much so that her phone eventually froze. “Being able to bring this gold medal home will just continue to show the power in women and continue to push ahead women in sports and in our country and internationally,” Duggan said the day after the game. Indeed, a younger generation of hockey players with gold aspirations and hopes to make a fair wage because of their skill with a stick and a puck were among those watching these celebratory images play out, no doubt saying, “I’m Gigi! I’m Hilary! I’m Monique! I’m Meghan! I’m Jocelyne!” the next time they take the ice and envision themselves in a high-stakes game. That, certainly, is not lost on these gold-medal winning athletes. For Lamoureux-Morando and her veteran teammates, they simply wanted to leave the program better off when they arrived. They have done that and far more. This was a performance, a victory, and, hopefully, a team that will transcend this sport, and a story and a force that has great potential to help grow women’s hockey.